The South Gloucestershire Food Plan has been led by the Public Health and Wellbeing Division in South Gloucestershire Council. The Food Plan addresses the nutritional needs across our lives as well as tackling issues of our modern times such as food poverty and obesity. It highlights the wider issues of food which will be increasingly important for the future. This includes the sustainability of our food systems, how we can help protect our natural environment and support our local food economy to produce healthy and more sustainable food. 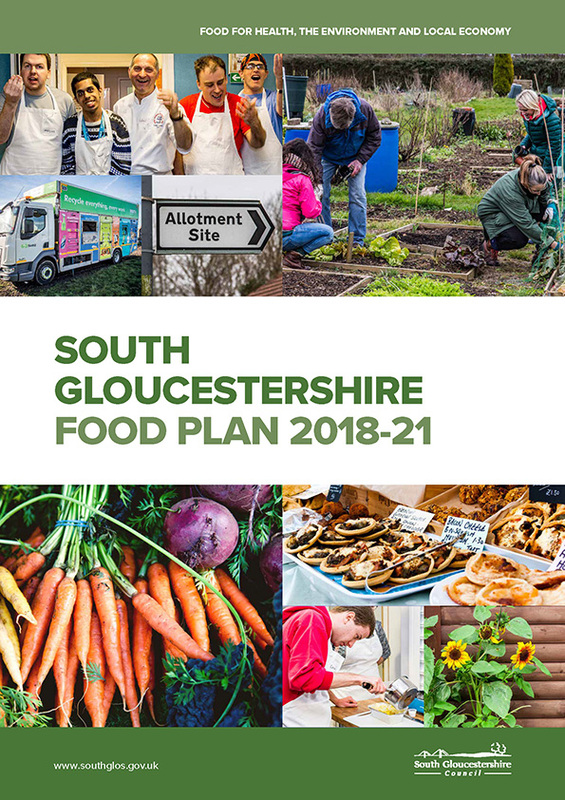 Through an enthusiastic and supportive network of stakeholders the Food Plan demonstrates a whole-systems approach to food in South Gloucestershire. The Food Plan has identified key priorities which are being developed into an action plan. Action plan: What to do first? The council and other public places develop food policies which include healthy and sustainable food procurement and this is reflected in its food provision. Food is integrated into other strategies and plans i.e. biodiversity, environment, housing and planning. A communication and information strategy is developed to increase the profile of food and improve education. Front-line staff have a good level of knowledge of current nutritional guidance for their local communities and are confident in delivering this i.e. Making Every Contact Count, NHS Health Check Programme. Early years providers, schools, colleges and universities develop food polices which incorporate food into the curriculum (which includes practical cookery and food growing) and serve healthy food throughout the day to pupils/students and staff. School meal providers and schools understand the uptake figures for their meals and develop a plan to promote and increase them. School meal providers and schools have a good level of knowledge of current nutritional guidance for children and young people and ensure they have the skills to deliver these in their food provision. School meals are tasty and as nutritious as possible. They contribute to increased fruit and vegetable consumption and reduced sugar consumption. Food banks, benefit and other relevant staff work together to establish a Food poverty action plan to reduce the need for emergency food. This will include reducing food waste, improving access to food and child hunger (free school meals, holiday hunger, breakfast clubs and Healthy Start).